At the Frankfurt Motor Show 2015, Porsche finally raised the curtains off its all new Porsche 911 Carrera 2017. For the first time Carrera is ready to roll with forced induction (except GTS and GT3) in its last fifty years. Hearing it from company, the model is equipped with latest technology, dynamic looks and better fuel efficiency. 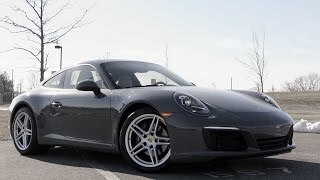 Let us have a look at the review of Porsche 911 Carrera 2017 to evaluate how far these words are true. 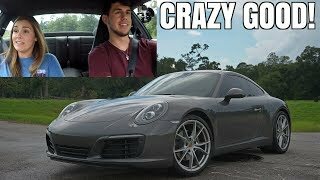 The interior of Porsche 911 Carrera 2017 holds more about the technology, however when we talk about Porsche comfort and luxury is guaranteed, so let’s get going with the technological upgrades. Featuring online navigation module, the all new Porsche Communication Management system has everything to grab your attention. Offering control over operations through a seven-inch screen, this not only adapts multi-touch gestures but can also understand handwritten inputs. While the smartphones can be connected through Wi-Fi, your iPhones get a new treat with Apple CarPlay. Apart from this the new system, for the first time for any 911, also offers Google Earth, Streetview and Real-time traffic information. Moving ahead company also offers you optional Sport Chrono Package featuring four driving modes, Normal, Sport, Sport Plus, and Individual. Apart from these, rest all remains the same in the interior of Porsche 911 Carrera 2017 and we personally consider it as a positive sign. The exterior of Porsche 911 Carrera 2017 has limited upgrades when compared to the interior (fact is you don’t have much tech advancement options in exterior). Starting with the front fascia you’ll notice down below, a new bumper amalgamated with new light strips and air intakes, giving it a smarter look. The LED headlamps now feature revised daytime running lights. Moving towards the rear end of Porsche 911 Carrera you’ll notice the deck lid featuring some changes, and that’s with the vertical louvers over it while the new taillights inculcated with four-point brake lights looks sportier. Adding to the aggression at the rear end you’ll have a bumper with additional air outlets and gets further complemented with the raised ride height and wider rear wheels. In all the exterior of Porsche 911 Carrera 2017 is classy and sporty. The Porsche 911 Carrera 2017 comes with a 3.0 Liter Boxer 6 engine beneath its hood. The engine generates total output of 370 hp and peak torque of 448 nm paired to seven-speed manual transmission as standard and holds an option of PDK transmission as well. With its new power figures Porsche 911 Carrera 2017 top speed touches mark of 183 mph (182 mph with PDK) and can sprint from 0-60 mph in just 4.4 seconds and 4.2 seconds respectively. Company presents another engine options with Porsche 911 Carrera S 2017 version which comes with same engine but generates total output of 420 hp and peak torque of 499 nm. The S variant can touch the top speed of 191 mph with manual transmission while with PDK attain 190 mph.